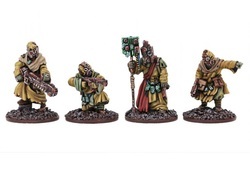 I've covered a a pretty wide variety of Pig Iron Productions 28mm scale models already, but there's a few older models still well worth talking about, which I'll be covering today right along side the very latest release from Pig Iron Productions called the Kolony Feral HQ pack. First up is the Heavy Infantry Assault Squad. While the System Troopers have some limited options, like what heads you glue on, the Heavy Infantry series are mostly all single piece castings. There's no parts to glue on, aside from the heavy weapon guy requires gluing his weapon in place, so the only other assembly to speak of requires gluing the models to a base. Like most of the PIP models, these too come with very thing integral bases. Normally I'm not a fan of integral bases, because they really don't help the models stand much on their own, but these are so thin, that you can easily cut them away, or you can file them down a little further, so when you glue them to a base they're barely visible. I thinned them out a bit more by filling, and at a glance you can't tell they have an integral base. There's five completely unique sculpts in this set. All of the sculpts are standing, holding an assault/pulse rifle of some sort. One of the five sculpts is that of a heavy weapon trooper, who is carrying around a rather large heavy-bolter-looking weapon, and his weapon comes separate, and it fits in place perfectly during assembly. What stands out most in this set is the helmets and armor, and I like that they're not fully armored. It's like they're wearing military BDUs or something, but have armor in the chest, head and groin region, pretty much protecting vital parts on the body. I think this design allows for limitless painting possibilities too, because the clothing areas can be one color, and the armor bits and rigging/pouches can be another. The studio painted models are really nice with a camo print on the cloth areas, and a military green elsewhere. I like gray and green myself, and I think it worked out nicely. I bet these would look nice as modern SWAT types too, in a blue and gray color scheme. The weapon/rifle design really stands out too I think, as it's very different than the design utilized by the System Troopers. You can also see the faces of the models, since the helmets are modeled with the visors opened. Quite frankly, I like these older models much more than the existing System Troopers. Although PIP is working on newly re-designed System Troopers, and those I can't comment on yet. They might surprise us all with those, it's hard to tell. This five piece set carries a price tag of 8.00 GBP, which converted equals about $13 USD. Pig Iron Productions models don't come with plastic bases, so you'll want to make sure you have some on-hand. I used basic 25mm beveled GW style slotta bases with mine, which is how they're based in the photos, but those aren't included. As the name implies, this is the command squad set. This set also comes with five completely unique sculpts. There's a commander, medic, sniper, communications officer and what they call a task-droid included in this set. These also have the same design at the other Heavy Infantry models, so they too feature a helmet with the visor open, with armor covering the chest, back and groin regions, and a jumpsuit or military BDU clothing underneath. These are mostly single piece castings, but the communications officer has a backpack to glue on, and the sniper's rifle requires gluing in place too. Both of those separate pieces also fit like a glove when it came time to assemble the models. It seems like the weapons carried by these guys are smaller, carbine-like versions of the larger assault/pulse rifles carried by the Heavy Infantry Assault Squad models. The sniper also features a really impressive sniper rifle, which also looks like it belongs right along side the other weapons in the Heavy Infantry series. He's a little different, because he's wearing a baseball-cap, instead of a helmet. The medic is crouched down taking items out of, or putting items in to his medic-bag, and the sniper is also in a relaxed crouched position at ease. The robot doesn't impress me all that much, he's probably my least favorite model in the set, but he's not ugly, or a bad model by any means. It looks like a utility robot, as he really resembles a mechanical pack mule more than anything else, because he's carrying three bags worth of stuff. I'd like to have seen him with at least a weapon of some sort. This set also retails for 8.00 GBP, or $13 USD. Like all PIP models, these don't come with plastic bases either, so you'll need to round some up. I covered the existing Kolony Feral models some time ago here at WarGameGuru. They're a unique post-apocalyptic-looking bunch, wearing rags and armed to the teeth. These are essentially the command models for that faction. This is a 4-piece set of models, and these are multiple piece castings, only there's not a lot of pieces to assemble. You are given 4 bodies minus heads, and one of the 4 bodies is missing a right hand and a head both. 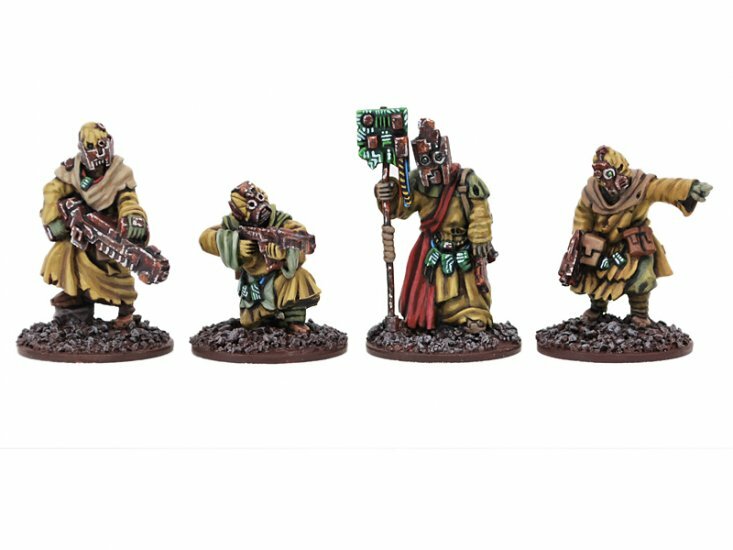 The tallest model is like a flag bearer, as he has an almost witch-doctor-looking, rather long post apocalyptic mask, and he holds a staff with some metal bits on it. The staff comes with his right hand attached, so you need to glue that to the wrist socket on the model, and then the head onto the neck spot provided for it. All of the pieces fit nicely, although like most Pig Iron Productions models, the sprues which the heads come on are rather thick metal, so you need to cut them free just right, and file them down to the desired roundness to fit the rounded out neck region provided to accept a head. That aside, they didn't seem to have any terrible mold lines that were out of the ordinary, and no flash was present either. It didn't take but a few minutes to assemble these, because really the only thing to glue on is the heads. These too have the thin integral bases, and like all PIP models, no actual plastic bases are provided, so you'll need to round up the plastic bases of your choosing to base them nicely. As you might have guessed, these too will set you back 8.00 GBP, which equals about $13 USD. I'm yet to see a model from Pig Iron Products that I didn't like yet. Well, I can't say I'm in love with the taskdroid, but I've certainly seen worse robot models out there. The rest of the Command set is nice enough that I can overlook how average that robotic pack mule looks. In all honesty, I like these older Heavy Infantry series models more than many of the newer models from them. I think it's that I can see the faces, and while the helmets are rather large, there's something about the entire look and feel of those models that draws me in. They could serve so many purposes too. Like I said earlier on, they could be sci-fi SWAT, zombie survivors in biological-like protection suits, space marines, and so on. My only ongoing gripe with Pig Iron Productions is the lack of plastic bases. Maybe one of these days they'll surprise me, and a set will come out and it will have plastic bases in the pack. That's really the only thing they're missing. Cost-wise considering metal is on the rise at the moment, what they're asking isn't all that bad for the 5-model sets. Although I do still wonder why the 4-model sets cost the same as the 5-model sets. They have me scratching my head on that one. Maybe it's that it cost more to produce the extra sprue with the heads and staff on it? Nonetheless, the new Kolony Feral HQ set is a nice addition to the growing Kolony Feral faction line of models. These post-apocalyptic nomad-looking models are quite nice looking, and these new ones fit right in with the existing models seamlessly. I really like the long almost voodoo witch-doctor-looking mask on the one who's holding the staff too. That's a nice touch. Pig Iron Productions is also working on all new System Trooper models at the moment, so keep an on WarGameGuru for more on those once they surface. I'm curious to see what they come up with, as there's only a body shot at their website at the moment, without arms, head and weapon. Another recent development is that Pig Iron Productions will support the new sci-fi skirmish game system from Ambush Alley and Osprey called Tomorrow's War. Stay tuned for more on that front as well.